A reader commented recently that it would be nice to feature a few things on the blog that were more affordable. Well one thing that is certainly affordable for most men is a good wallet – and given that he will use it many times a day, it represents a good return on investment. There are only a few quality aspects worth considering with leather goods: the type of leather, the type of stitching and (to a lesser extent) the finishing of the edges. 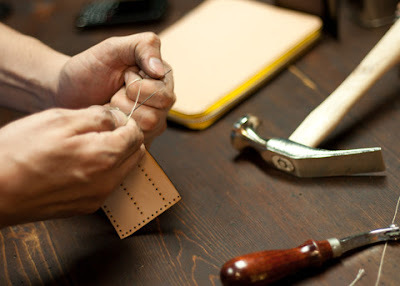 Leather can be a matter of personal taste, but stitching is always better by hand, as the saddle stitch is stronger than anything that can be done by machine. 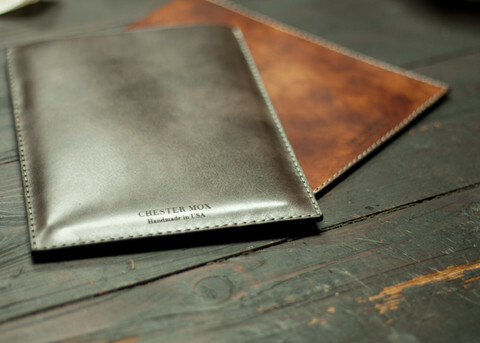 One company that does good hand-stitched leather goods is Chester Mox of Los Angeles. 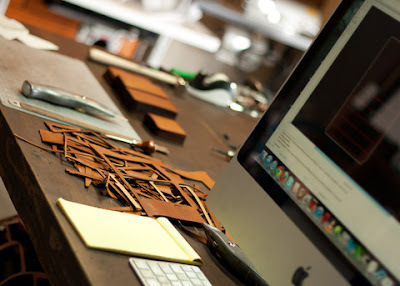 A small, family-owned company, it makes everything by hand and to order. It’s worth using your imagination when looking through the range of products on the website, therefore, and the excellent blogis another good source of inspiration. I trialled one at the end of last year and it has done very well. It will particularly suit those that like more casual accessories, given the thicker Horween leathers used most widely by the company. Recent additions to the range include Horween’s Essex – a calf leather put through the cordovan tanning liquors – and Ilcea antique calf (below; some readers may recognise it). 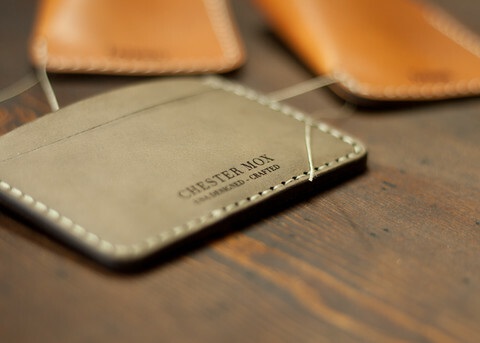 You can follow the discussion on Chester Mox hand-sewn wallets by entering your email address in the box below. You will then receive an email every time a new comment is added. These will also contain a link to a page where you can stop the alerts, and remove all of your related data from the site. Simon, interesting – was thinking of getting a new card holder as of now and this pops up. Just a quick question, do you think Ettinger is quality and worth the investment of Chester Mox is good enough? Do you know of anyone who makes a hand-stitched crocodile/alligator wallet (preferably in UK)? 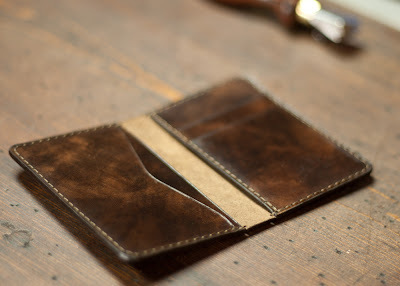 I carry my wallet in my rear trouser pocket –and keep it very thin with minimal cards/cash. I have been looking around, and the best I have found is Etttinger’s or Scuola del Cuoio.. but I neither is hand-sewn. Yawn — Chester Mox is making the same thing , same styles as about 20 other brands…It may be hand made, but certainly not very original. Actually, totally generic. For the man who wants to blend in, I suppose. 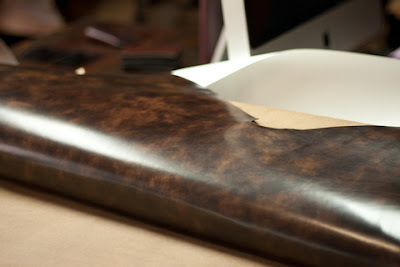 There are very few in the UK, and none that I know of working with Horween. What companies do you feel have a more unique selection? Simon, it may be not the best place to insert this question (got to admit, pretty new in this blog stuff), but I am looking so some quality Khaki and white cotton pants, preferably UK made. What brands would you recommend? No problem Alex, questions always welcome. I’m afraid I’m not great on recommendations for RTW, as I rarely wear it. But I do recommend Incotex for chinos etc. At Mr Porter or Trunk. I prefer the classic fit, though, which few places have. No one makes trousers in the UK anymore for high street sale. i can see the attraction of incotex, however they are a very italian-esqe trouser.. low, somewhat tight around the seat and narrow down the leg (even in the classic) .. if you like this and want to wear with italian jackets from the likes of boglioli etc then could work well but can look a bit odd with more classic english tailored jackets. also they are £200 for a cotton trouser & you can get MTM trousers made for £350-400 in anything you want ..
for this type of trouser i would go to somewhere like Banana republic and pay £45 in their permenent sale for this type of trouser which has its uses in everyday casual wear ..v ‘generous’ in the seat as made for US wearers but get them altered easily around the seat .. happy days! I find the classic style easily roomy enough in the leg and seat, and the bottom is certainly not narrow. I won’t argue they are worth £200 necessarily, but they are a lot better made than Banana Republic. on a more general note .. why does anyone think british made is so good? part of the reason for the decline in UK manafacturing is due to stupidly high costs (partly coming from inefficiency) combined with faulty workmanship, so how this reputation lasts i dont know? good old imperial propaganda still working its magic in the former colonies .. convincing everyone british is best ..what a sad joke that has become. i can understand if you like english style .. thats different but Made In England doesnt really exist anymore in tailoring outside bespoke … simon has covered a few that do like T&A .. but this is a dying business. 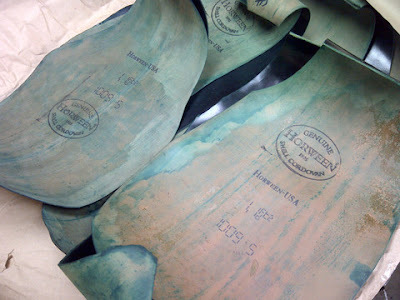 if you are ‘lucky’ enough to have anything made in the UK its probably made by someone resembling a cilla from the knicker factory in coronation street .. and is more interested in clocking off & going to the pub rather than getting involved in artisinal craftsmanship which is fawned over by clothes nerds on the interweb. Sorry Andy, but that’s a gross exaggeration. I’ve visited more than 20 factories around the UK that don’t in any way fit your description, from Northampton shoemakers to Oxford hatters, Scottish weavers to Welsh knitters. I agree that people should shop for quality, not location, but British manufacturing doesn’t fit your picture of it at all. Andy I’m afraid that you appear to be rather grumpy, and not in the spirit of this blog even in the slightest! Also to counter your argument that without patronage this high quality British made items will disappear into oblivion, so why not encourage people to buy good locally made goods? Andy, not that I think English made is far superior to any other single country on this planet. Just was born in the UK and didn’t appreciate some of the things that UK produced when I was young. Now working in a far flung corner of world and kinda miss the stuff from UK thats all. i was perhaps a little harsh but there’s definately more than an element of truth to my comments .. american clothes nerds on the net are especially funny and have a rose tinted view on anything english made (still good for barbour jackets & saville row travelling visits i guess..in these austerity fuelled times we need all the help we can get). alex, i see your issue now, you are missing good old blighty. i suggest to get over this problem standing fully dressed under a freezing cold shower while having a friend stand nearby whilst moaning about their life. i think thats very true simon .. infact there seems to be an antipathy by the mainstream in the UK toward traditional english clothing, in particular any type of clothing previously associated with the english upper classes. therefore for eg if you wore a tweed suit in the uk these days (outside of actually shooting grouse or an Igent meetup)you would be met with a reaction somewhere between ridicule and outright scorn. i think this is to do with the engish having a tough time with the class system post 1960s ..liberal meritocracy (of class but strangely not wealth) ideology has permeated through english society so anything which resembles the upper classes is met with derision rather than elevating it as aspirational (as previously was the case). where there is a schism is that the americans never got the note .. the US style aware are still trying to emulate the english upper classes .. go onto somewhere like style forum and you see the protagonists of the 3 piece tweed suit (obv far more upper crust than a regular suit), braces .. bowties .. the whole caboodle. so i can understand why the english gravitated towards italian style .. safer to escape all the confusion ..its seen as modern and fresh .. ironically the italians are like the americans attempting to mimic the english upper classes with churches shoes, barbour wax jackets & tweed (well tweedy like cloths like cashmere jackets).. so you get a bizarre feedback loop. Its such a shame as, without sounding too much like a snob I hope, the upper classes have always been the best dressed. I think in recent times antipathy has been thrown towards the upper classes while many of the faults actually come from those who are aspirational upper class but with bad taste, who think driving a landrover and taking phenomenally expensive days shooting characterize them as posh but they are actually just mimicked the aristocracy in bad taste. Nice leather bag collection. i like to collect hand wallet. it is a style statment for every young person. Leather wallets are among the most popular of its kind mainly because of their durability, versatility and beauty. Indeed, most of the iconic, classic and trendiest wallets for women are made from leather with accents. Of course, wallets are also made from other materials like fabric, plastic and even metal but leather still dominates the market. 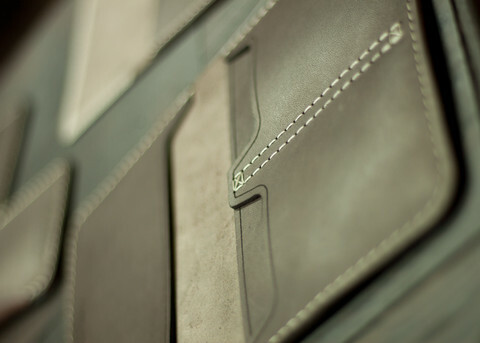 Do you know where Aspinal have wallets made ? Simon, I must say I’m loving this blog since stumbling upon it some weeks ago; though a piece on wallets is in my case at least—a complete waste of time. I’ve largely thanks to you, got a lot less to keep in one. Apologies for asking in this thread – I have an old vintage crocodile wallet after grandfather that needs repair (cleaning and stitching ). Does anyone know where in London this can be done? I hope you and the PS team are doing well. I am currently considering a wallet or cardholder and belt commission at Duret Paris. I’m very drawn to the nubuck crocodile but I’m unsure of it given the cost/flashiness so I’m considering simple black calf as well. If you have any first-hand experience with the brand of have heard any comments from customers in your network, would it be possible for you to share your thoughts? I am most curious about a) value relative to competitors at their price/quality range and b) any recommendations on leathers – I am drawn to their black nubuck crocodile but it might be a bit flashy and is quite expensive. Just an update for the community – since the original post, the maker (Bellanie) has gone through additional training and overhauled her offerings. People who have seen it in person say the results are even better than before.